Jamaica’s election didn’t generate the same excitement in the American media as U.S. President Barack Obama’s historic trip this week to Havana, the first since Calvin Coolidge visited in 1928. But it’s only the third time that Obama himself has traveled to the Caribbean at all – he visited Jamaica in April 2015, and he went to Trinidad and Tobago in 2009, when it hosted the 5th Summit of the Americas. Though Obama lamented recently that Latin America and Africa both deserve far more attention, it’s a sentiment nearly every modern U.S. president has expressed; a joint policy agenda shared by two conservative presidents, Republican George W. Bush and Mexican conservative Vicente Fox, both elected in 2000, virtually disappeared from view shortly after the September 2001 terrorist attacks. Bush’s sole trip to the Caribbean was to Cartagena, on the Colombian coast. Bill Clinton, over his eight-year presidency, visited only Cartagena, Haiti and Barbados. If Latin America is the forgotten stepchild of U.S. foreign policy, the Caribbean is its abandoned love child. For decades, understandably, Havana has played an oversized role in the American political and cultural imagination. 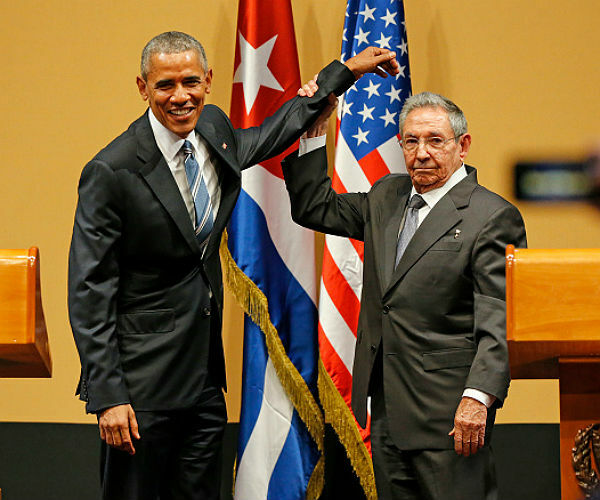 Though the particular terms of the Obama administration’s engagement with Raúl Castro are controversial, the dysfunctional bilateral relationship had long become a thorn in advancing other U.S. priorities in Latin America. For the foreseeable future, Cuba’s economic opening, if not necessarily its political liberalization, will captivate and engage Americans, as American businesses gorge on Cuba after a half-century of pent-up demand for investment and as tourists enjoy once-forbidden fruits. But that shouldn’t mask other priorities. The Caribbean’s island nations alone comprise over 42 million people (3.5 million of them in Puerto Rico), a population that amounts to over 10% of the U.S. population. If a bipartisan consensus now generally agrees that the U.S. embargo against Cuba has endured far too long, propping up the Castro brothers’ autocratic socialism far longer than it would have otherwise survived, that same bipartisan consensus risks forgetting why the embargo began. It’s hard to believe today, so far removed from the Cold War, that another country could install nuclear weapons on any Caribbean island. But it’s still the case that the Caribbean represents the soft underbelly of American regional security, and there’s no reason that Russia in the 2020s or China in the 2040s could exploit it to pressure the United States just a few hundred miles from its coastline. While businessman Donald Trump marches to the Republican nomination by promising to build a security wall along the southern border of the United States, there’s virtually no talk of greater economic or security coordination in the Caribbean, which could reap far greater long-term benefits. An economically prosperous and political stable Caribbean makes the region far less susceptible to hijinks within an increasingly multipolar world. Curiously, U.S. policymakers spend more time today strategizing about Taiwan, in China’s geopolitical backyard, or about Ukraine, in Russia’s, than about the dozen or so countries that comprise the Caribbean (not including Mexico, Central America and South America), only one of which happens to be named “Cuba.” The proportional amount of U.S. military and economic aid to the Caribbean reflects the same level of disengagement. As of FY 2013, the United States spent more on military aid to Ukraine – and even to Mongolia – than to the entire Caribbean region (again, not including Mexico, Central America or South America). Economic assistance to the Caribbean is nearly as lopsided. As of 2013, USAID spent around $57.9 million in the Dominican Republic, a country of just over 10 million people, while it spent $155.1 million in Georgia, a former Soviet republic of under 4 million. USAID spent $31.5 million in Jamaica, a country of just 3 million people, but it spent $56.7 million in Armenia, which has roughly the same population. Haiti, a country of around 11 million, and the poorest state in the Western hemisphere, that is still recovering from a devastating earthquake in January 2010, received $378.8 million from USAID, though the agency spent nearly as much, $367.2 million, in Somalia, which also has roughly, the same population. For now, the ability of Puerto Ricans to move to the U.S. mainland is a crucial financial safety valve. But after years of economic malaise, in part due to American policies that skewed market incentives away from agriculture, then instituted and removed special tax treatment for Puerto Rico, it’s arguable that Washington’s interference has done more to impoverish than enrich the island. For now, Puerto Ricans have avoided the kind of radical left-wing politics that motivated Venezuela in the 2000s or Grenada in the 1980s or Cuba in the 1960s. But in a world where high-income countries like France, the United States and the United Kingdom prove subject to protectionism and xenophobia on the right and dabble with full-scale socialism on the left, another decade of crisis and stagnation could spawn the kind of fierce nationalism that exploded in the 1940s and 1950s. At its most extreme, Puerto Rican nationalism resulted in assassination attempt against U.S. President Harry Truman. No one expects Puerto Rican radicalism to emerge tomorrow, or next year, or even in the next decade, but neither can Puerto Ricans be expected to endure decades of economic decline. Though Venezuela was always more of a gadfly than a genuine threat to American security, the late Hugo Chávez showed, through his Petrocaribe program, just how easily it might be to co-opt the region economically. Imagine a world where a Trump administration starts a trade war with China or otherwise antagonizes Xi Jinping, upsetting what has so far been a peaceful, decades-long détente between the United States and China. It could happen. As the United States augments its presence in the East Asia/Pacific region and, in particular, develops closer security ties with the Philippines and, quite possibly Vietnam, China might respond by trying to gain a foothold in the Caribbean. Cheap Chinese credit has bought the loyalty of more powerful and wealthier nations than, say, St. Kitts and Nevis, or Antigua and Barbuda, both of which have defaulted during the 2010s. Moreover, unlike the buffoonish ‘Bolivarian’ socialism of the chavista regime, Chinese influence across the Caribbean would be expected to be far more subtle. Nothing today indicates that the U.S. national interest vis-à-vis the Caribbean is in imminent danger of collapse. Moreover, US rapprochement with Cuba is an opportunity to show that the United States has moved on from the kind of gunboat diplomacy that characterized its neocolonial approach not only to Cuba, but much of the Caribbean, in the 20th century. Just as U.S. Secretary of State John Kerry quietly laid to rest the Monroe Doctrine in 2013, Obama’s trip to Havana is a good-faith demonstration that U.S. policy in the region will start from the basis of mutual sovereignty and respect. But as the scars of the Cold War recede, and U.S. national interests transform to meet new challenges in the middle of the 21st century, strong bilateral relations with Cuba are a first step, not an endpoint, for American policy in the Caribbean.